Other Products by Endura. 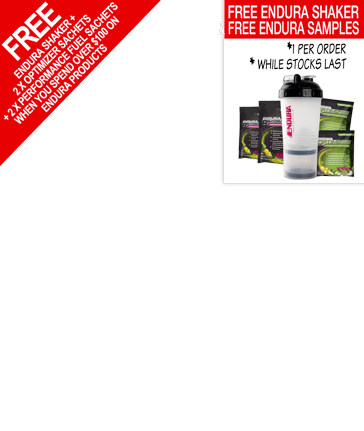 Search other Recovery Protein products. Endura Optimizer provides a balanced ratio of protein, carbohydrates and peptide-bonded amino acids with an optimal amount of electrolyes which provides a superb source of metabolic fuel for working muscles and speeds recovery. Endura Optimizer combines Hydrolysed Whey Protein Isolate, the highest biological value protein available with glucose polymers and pure crysatalline fructose. These multiple energy sources are metabolised at different rates, resulting in a steady stream of nutrients into the bloodstream for prolonged periods to enhance endurance and stabilise blood sugar levels. Fructose is included not only as a carbohydrate source, but also to speed up gastric emptying. This becomes particularly important when the product is used immediately before or during events. This natural sugar, commonly found in honey and fruits, is also very sweet, and helps to enhance the flavour of the product. After all, when you're training hard it does help to have something that tastes this good. 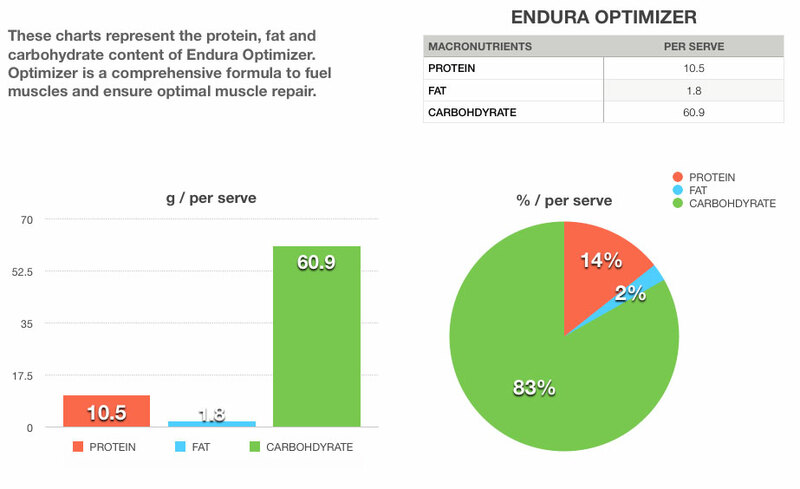 Hydrolysed whey protein isolate is the perfect protein for addition to Endura Optimizer. Whey protein isolate is perhaps the highest biological value protein yet discovered, with a full complement of essential amino acids, three of which are the branched chain amino acids1,2. These are essential to muscle and tissue healing, and ensure that you get the fastest and most pain-free recovery from your chosen form of exercise. Being hydrolysed, the protein is pre-digested, meaning that it absorbs more rapidly and is lighter on the stomach. When it comes to achieving peak performance and maximising your training, quality nutrition can make all the difference. The high quality protein contained in Endura Optimizer provides amino acids to rebuild damaged tissues and carbohydrates to rapidly replenish glycogen stores depleted during physical exerices. Endura Optimizer is the key to enhanced endurance and rapid, complete muscle recovery. To make 1 serve, mix 4 level scoops with 500mL water. For Maximum Endurance (prolonged exercise longer than two hours): Every 15 minutes alternate one serve of Endura™ Optimizer with one serve of Endura Electrolyte Rehydration Formula. 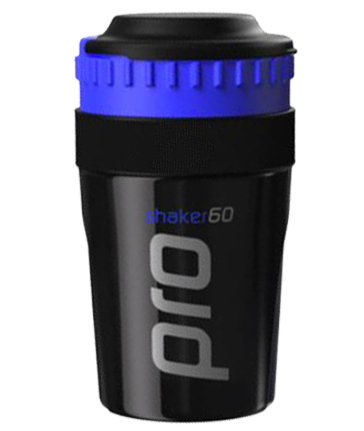 Assist with repair and maintenance of muscle tissue; Assist replenishment of depleted glycogen stores; Replace lost electrolytes; Assist lean muscle gains; Enhance endurance. Endurance athletes; Marathon runners; Triathletes; Resistance trainers; Weight trainers; Any athlete or sports person undertaking intense physical activity. If used during exercise, the food should be consumed in accordance with directions, to avoid the possibility of gastro-intestinal upset; and the food must be consumed with an appropriate fluid intake. Not suitable for children under 15 years or pregnant women: should only be used under medical or dietetic supervision. INGREDIENTS: Maize maltodextrin, Hydrolysed whey protein isolate (13%), Fructose, Cocoa powder, Medium chain triglycerides, Magnesium amino acid chelate (Meta Mag™ - Magnesium diglycinate), Calcium hydrogen phosphate, Slippery elm bark, Chocolate flavour (nature identical 1%), Potassium phosphate - monobasic, Potassium phosphate - dibasic, Potassium phosphate - monobasic, Vitamins/Minerals (ascorbic acid, ferrous fumarate, d-alpha-tocopheryl acid succinate, nicotinamide, pyridoxine hydrochloride, riboflavin, thiamine hydrochloride, folic acid, biotin, cyanocobalamin).